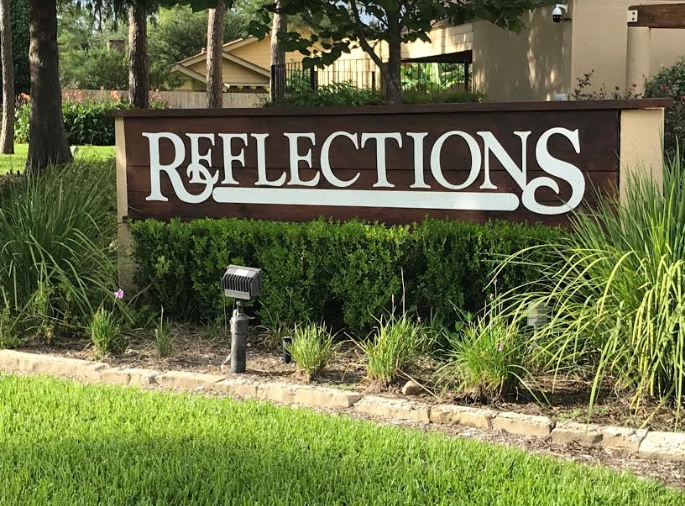 This website is for the homeowners and residents of the Reflections Homeowners Association to communicate information about upcoming events, items of interest to the neighborhood, calendar of events, security reports and information from the Board of Directors monthly meetings. As time goes by, hopefully you will see this site further expand and develop to encompass the needs and interest of our community. To join and become a member, which will allow you full access to this site, please click on the sign up page and follow the instructions. Again, only homeowners and residents of the Reflections HOA can join. Your name and address will be verified and you will be notified via your e-mail address of permission to access the site. At Reflections, our residents enjoy living in a 188 home subdivision bordered by an 8 foot brick wall with a large swimming pool (four 25-yard lanes for swimming laps), a 3/4 mile jogging/walking trail along 2-1/2 acres of open area, two tennis courts, a beautiful modern playground, and a recently remodeled clubhouse available for party rental. We have an Active Social Club and participate in activities such as Neighbor's Night Out and activities for the children. Combine this with an ideal location just south of Houston's Energy Corridor and it's no wonder that our current homeowners have lived here on average over 10 years indicating they really like it here. About 120 of the homes were built during the period 1979 to 1982 with the balance built in 1988 and 1989. The subdivision was originally designed with amenities for 350 homes so the large common area in the center of the subdivision is rarely crowded. The average lot size is over 10,200 square feet so there is plenty of space between you and your neighbor. The homes are spacious with an average living area of 2,600 square feet. Most of the homes have 2-1/2 or 3 bathrooms. If you have a large family or just like the extra space, 59 of our homes come with at least 4 bedrooms. If you prefer to swim in your own backyard, 34 homes have a swimming pool.